Friday morning I set out for work armed with a flapjack for sustenance. It was Bill’s flapjack. He gave it to me because I had already eaten my flapjack days before–on Monday, one day after purchase–and had also eaten the last of the frosted mini wheats. It was a very Bill-like thing to do. Plus he likes to make porridge at work for breakfast. I don’t like to make porridge because it overflows the bowl too easily in the microwave. Unless it’s pinhead oats that have been slow-cooked that I am just reheating. Sometimes Bill cooks oats overnight and in the morning makes me a breakfast container with cinnamon and golden syrup. It’s a Bill-like thing do to. When we used to work together he would make me a bowl of oatmeal for breakfast–we were in Texas and it was oatmeal then–and I would eat it as he drove us to work. I remember when I first got the job at his company and (probably) the first morning we were driving in and laughing together and he said, Why did I ever drive to work without you? But life morphs along, and now he drives to work without me and I take the bus, but I had Bill’s flapjack. As I crossed the Liffey Friday morning, I looked out at the river and reminded myself how cool it was to be taking a bus to my job. In Dublin. I decided to get a scone for breakfast and save the flapjack for afternoon snack, afternoon snack being just as important as breakfast. I’ve been promising myself a morning scone since my bus changed routes due to LUAS construction and I now get off on Camden Street. Because a girl does need a treat when ten minutes is added to her commute. And Camden Street is delicious, and is getting more so every day. 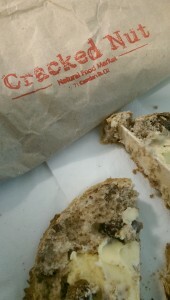 At the counter at the Cracked Nut I ordered a scone and a latte. “The opposite of skinny,” I quip. When I arrive at my desk with my apple and cinnamon scone, I find a piece of banana bread waiting for me. A girl does love finding treats on her desk. I check my email and my benefactor is revealed. My friend has been a bit under the weather, stuck in the house with zero energy, so he was driven to baking. And he was kind enough to share some with me. “You respond to zero energy differently than I do,” I said. I’d spent every evening of the previous week horizontal on the sofa, sniffling and pitiful. And every morning taking a taxi into work. So, now on Friday: a flapjack, a scone, and a slice of banana bread. What began as lack, was now bounty, comfort provided in one of the best ways possible–baked goods. And delivered through the love of a husband, a city, and a friend.